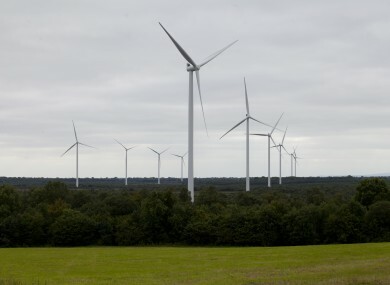 AN ALL-TIME record amount of wind energy was generated this morning, EirGrid says. Early this morning, around 7.15am, wind generation peaked at 2,815 megawatts (MW) on the island, breaking the previous record of 2,683 MW on 28 January last year. That is enough to power 1.8 million homes for that 15-minute period. Robin McCormick, director of operations, planning and innovation, at EirGrid said it was a real accomplishment for the grid operator, but created its own challenges. “Last night and into this morning we saw record levels of wind generation providing electricity across Ireland and managing this presented significant technical challenges for us. Dealing with wind generation of this scale on a small, island electricity grid hasn’t been done anywhere else in the world and so this is a huge achievement for EirGrid. “We will continue to optimise the electricity system in the hope that we can continue this trend,” he said. Wind-generated electricity accounted for 60% of electricity usage overnight and into early this morning, EirGrid said. Excess wind-generated electricity that could not be put on the transmission system was exported to Great Britain via interconnector links to Scotland and Wales. Email “This morning's wind generated enough electricity to power 1.8 million homes”. Feedback on “This morning's wind generated enough electricity to power 1.8 million homes”.